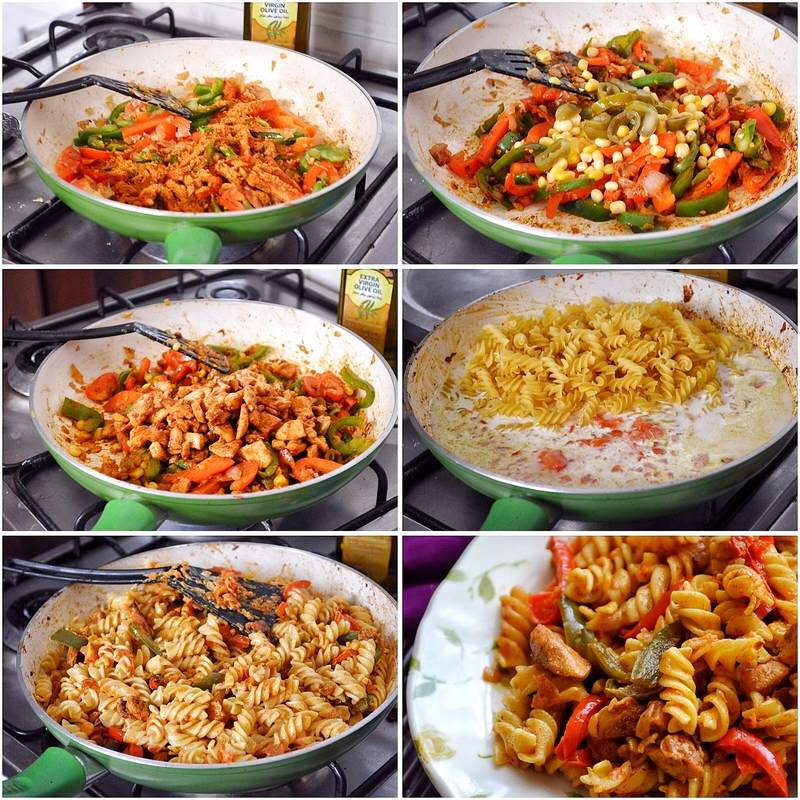 Chicken Fajita Pasta — a dish made in one single pan, even the pasta gets cooked in the same pan. How easy is that? The word fajita, cajun, taco makes me so happy. I simply love Mexican food. I am slightly Mexican food OBSESSED. Maybe because of their zesty flavours. They’re such a fun food to make and to eat. 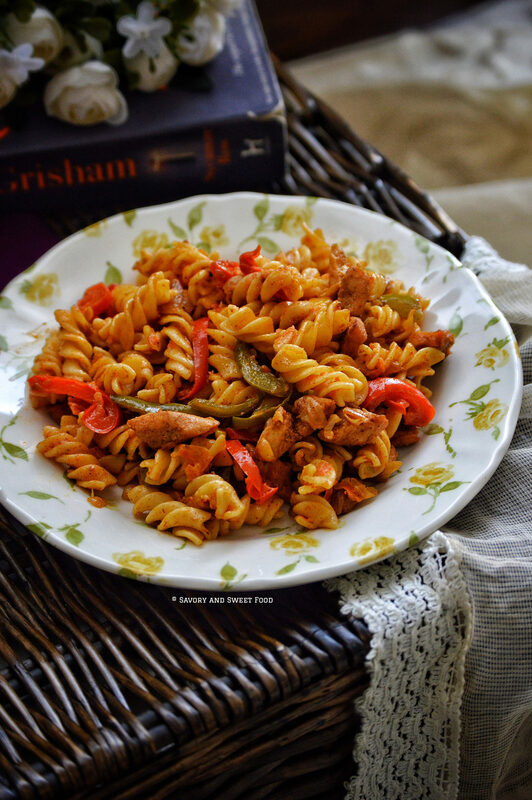 This one pan chicken fajita pasta can be quickly and easily tossed together. 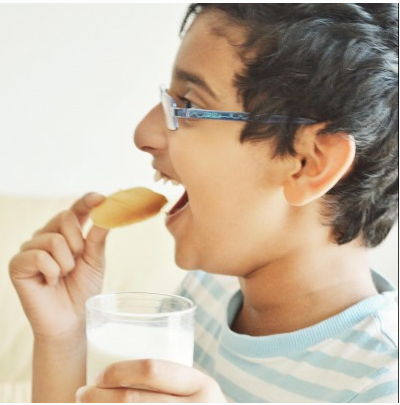 Its spicy, little creamy and lively with flavour. It sure is a fuss free recipe. 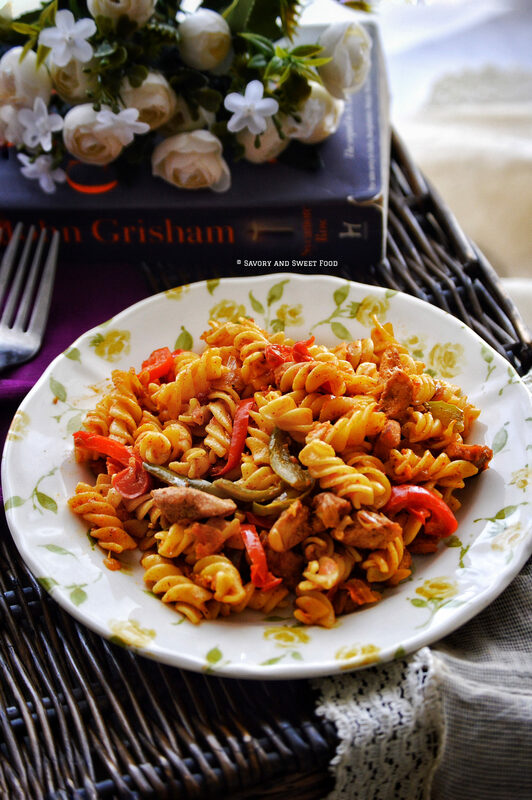 Everything is cooked in one pan including the pasta, now you can’t beat that. :D I got the idea for this amazing dish from the blog, Kevin & Amanda’s Recipes. Check out their website, they have lots of yumminess in there. In my family we really enjoy spicy food, but you can adjust the amount of seasoning in this recipe to best suite your own taste. The taco seasoning I used was the extra hot one, and I added extra pepper too. My little darling, my 1 1/2 year old son is too young for so much spice, so I skipped the pepper in his portion. Even then, it was a little spicier than the food I give him usually. But he loved it. I so love it when my hero enjoys his food. 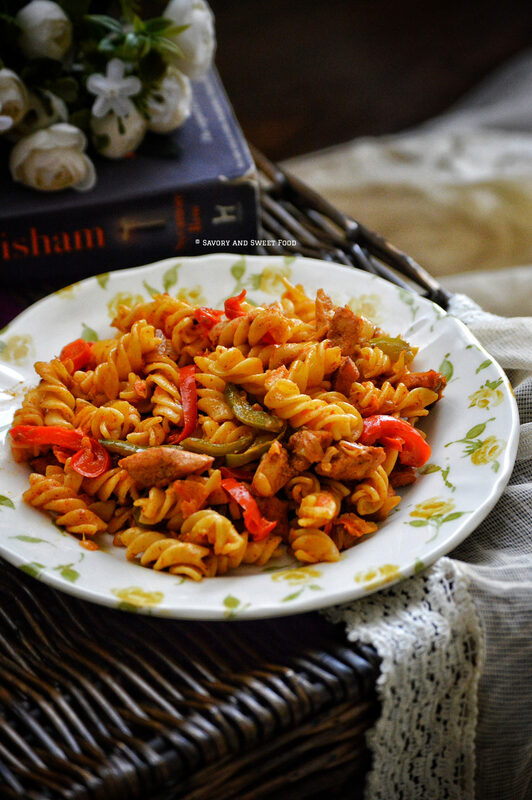 You all have to try out this super simple pasta. So here goes the recipe. Enjoy! 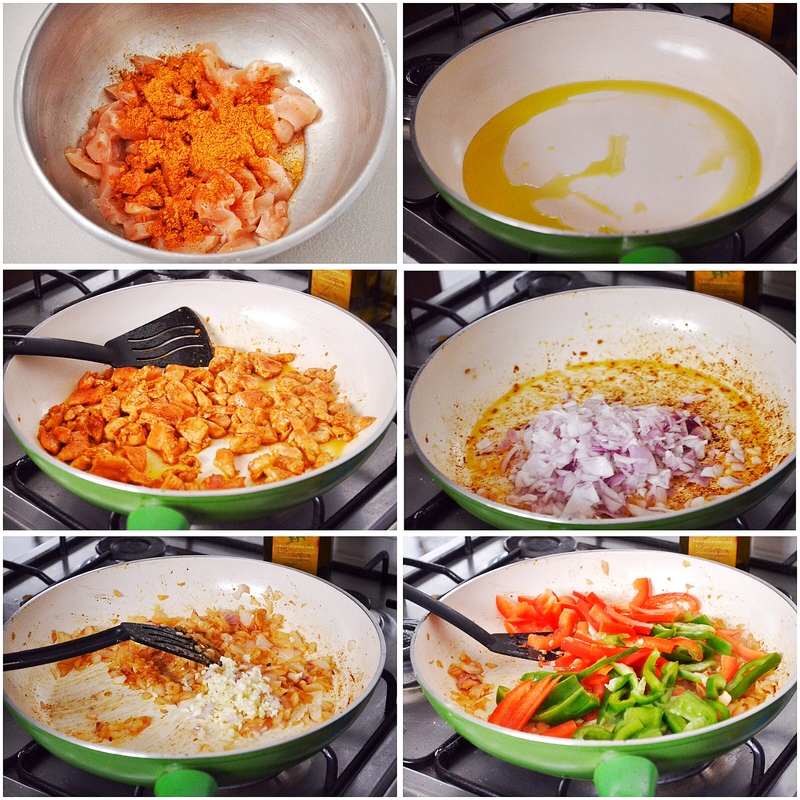 If you don’t get to buy taco/fajita seasoning, you can make it at home with few basic ingredients. Check out the recipe for that here. 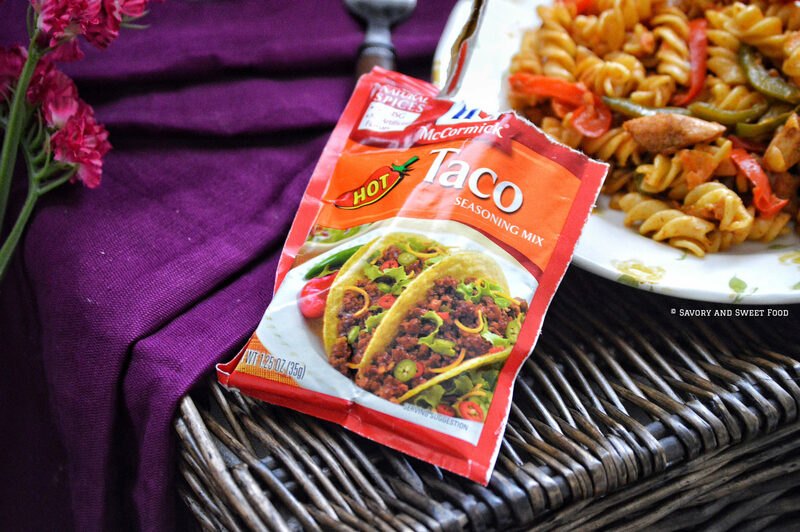 You can use cajun spice too instead of taco seasoning. Be very careful when adding salt as the seasoning contains salt. If your chicken stock also contains salt, very little salt will be enough for the pasta. Cut the chicken into strips or bite size cubes. Season it with 1 1/2 tbsp of taco seasoning. In a skillet, add olive oil and heat on high. Place the chicken in single layer and cook the chicken till seared and browned. Remove the chicken and keep aside. Add a little more olive oil to the pan and add in the onions. When it turns soft, drop in the garlic. Sauté for a minute. Add the red and green capsicum. Cook till it is soft and veggies are slightly blackened. Add in the remaining 1 1/2 tbsp of taco seasoning.mix well. Add the sweet corn, and jalapeños. Add the cooked chicken to this. Cover and cook for a minute. Remove these from the pan and keep aside. In the same pan, add the stock, cream, tomatoes, uncooked pasta and salt. Stir to combine and bring it to a boil. Then cover with a lid, reduce heat to low and cook for 15 minutes until pasta is tender and the liquid is mostly absorbed. Add in the chicken and veggies mix back into this pan and stir well to combine. Add black pepper if needed. Cover and cook for a minute. 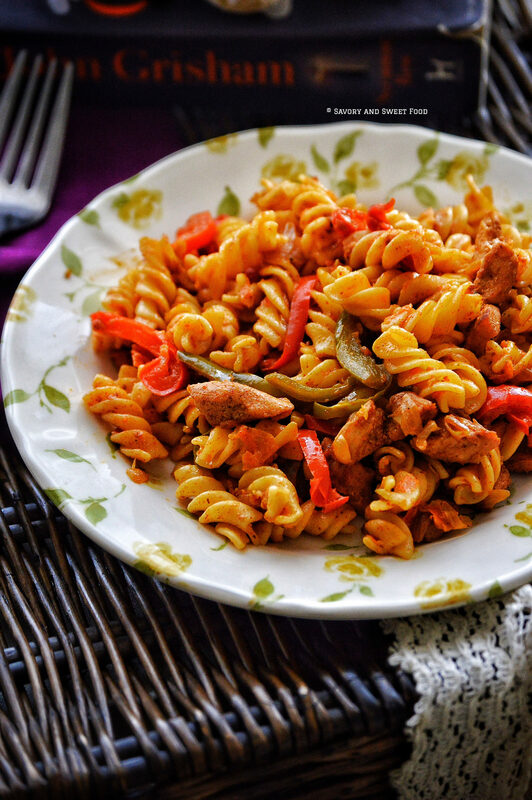 Chicken Fajita Pasta made in one single pan, even the pasta gets cooked in the same pan. How easy is that? If you don’t get to buy taco/fajita seasoning, you can make it at home with few basic ingredients. Check out the recipe for that here. Hahaha thank you Rafeeda! It’s so easy, make it. Does it taste the same if I make this ahead of time , like one day before? Yeah it will stay same. But if you feel that it got dry the next day, just pour in some cream and reheat it.